Our Acala Mala bracelet holds a close connection to the earth, featuring White Fossil and Picture stone. Believed to protect and nurture, this necklace will bring comfort and alleviate fear. The Acala Mala Bracelet is made with 8mm beads. Only reason it is not 5 Star is I wish it was a tad bit smaller...tiny wrists I guess! Excellent overall experience. From placing the order to receiving the bracelet. The quality of the bracelet is excellent as well. 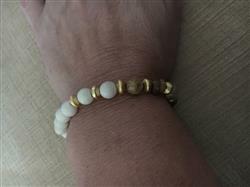 I would purchase from Mala Prayer again! This bracelet is exactly what I hoped it would be! It’s well made, beautiful and goes with my daily attire. I have been wearing this bracelet everyday! It matches any kinds of outfits since it's pretty minimal and has natural colours.